Elon Musk, his Wiki’ bio’ says, wants to go to Mars – wants to go so badly that he’s created SpaceX to fulfil the dream. I am much the same. Well, at least I want to go to Mars (or even the Moon as a compromise) and have done since I was six. Unfortunately, unlike Elon, I can safely say that I will never go. Perhaps you are much the same. Don’t be entirely disheartened though, because there is a way of getting an inkling of what it might be like to explore another planet. After all, many of those 1950s planet-scapes by Chesley Bonestell were based on real places on Earth. For Mars, perhaps the deserts of Arabia, Utah or Chile are the best stand-in we have. But for the Moon, I reckon there is somewhere much closer to home – Iceland. That Iceland is closer to the Moon than most places was recognised when it came to training the Apollo astronauts. For Iceland is such new land (it erupted from the north Atlantic within the last few million years), so largely untouched by man and so barren, treeless and rugged, that parts of it really do look off-world. Of course to really immerse yourself in a landscape takes time. The Apollo 11 crew had just a few bus-tour hours to look around; Apollo 17 had days. Future Lunar explorers will likely rove for a week or more. 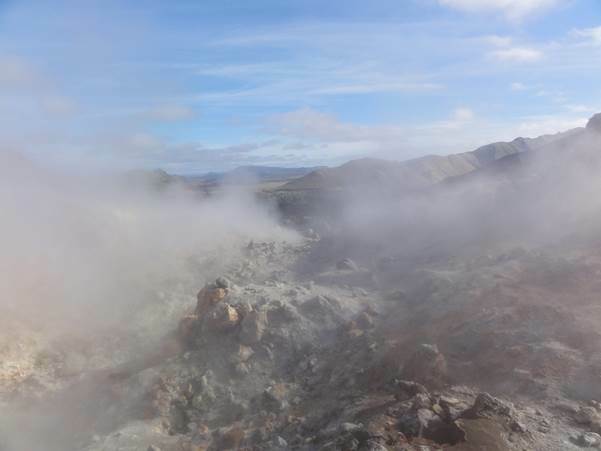 In Iceland the same is true – to really get the place you need to trek through it, feel the scrunch of scoria underfoot, hear the hiss of distant steam. What’s more, if you choose the end of season to do it, you’ll also have another astronomical opportunity - the possibility of seeing the Northern Lights under dark skies. This article is in two halves. The first half just gives you basic information on how to do the trek. The second is a day-by-day account of the route with some of my own experiences thrown in. 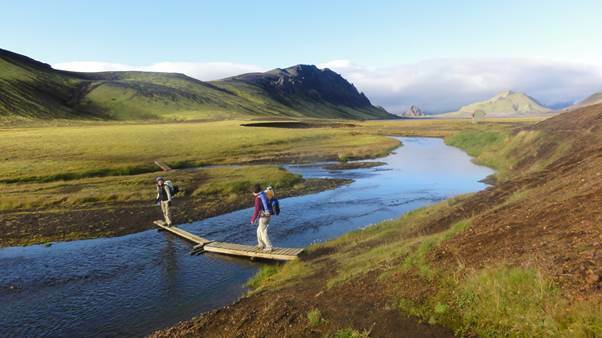 For my Icelandic trek I chose a well-known walking route – the ‘Laugarvegur’, or ‘Hot Springs Road’ – that runs between Landmannalaugar and Thorsmörk in the south of the island where the scenery is dramatic, accessible and Polar Bear free. The walk takes between two and six days, depending on how fast you go and whether you choose to extend it. Both start and end points are pretty remote, but both are well served by tourist buses in season. Most people do the trek north-to-south (i.e. from Landmannalaugar) because there is an overall drop in altitude that way. The days as described each start and end at a hut/campsite and they split the trek into fairly easy days of 4-6 hours walking. You could easily combine most pairs of days to make one long one (but beware attempting this with Day 5 from Thorsmörk to Fimmvorduhals – it’s short, but much harder than the rest, especially in poor weather). For most British walkers, used to Wales, The Peak District or The lakes, the route shouldn’t be too taxing. However, if you want to stand a chance of seeing the Aurora (and getting a bit of solitude for that explorer experience) you will have to do it late in the season, as I did, which adds some extra challenges. Why do it late? The area is only accessible in Summer and during July and most of August it will be chocka with other walkers and the long days mean no chance of astronomical darkness. So for the astronomically inclined there is a narrow window of opportunity at the end of Summer – after the end of the main holiday season, but before the buses stop running (currently the 15th September). By extending to Skogar and using ordinary buses back to Reykjavik you could theoretically start in mid-September and finish after the last bus has left Thormörk. However, the huts may not be open and if the weather closes in over the pass to Skogar you could be stuck in Thorsmörk, so take extra clothes and food. Be aware that the late September weather over the pass can get very ugly indeed (read my own experiences below), including storm force winds and heavy snow. In the UK, the first two weeks of September are very little different from August and there is even a good chance of fine ‘Indian Summer’ conditions. So the first thing to say is that Icelandic weather is a bit different. Fortunately, most of the route is in the rain-shadow of southern Iceland’s big ice caps, so really persistent heavy rain is apparently unlikely. The problems are low temperatures and high winds. Daytime temperatures often don’t make it above single digits (Centigrade), whilst freezing nights are normal. Add some seriously high blustery winds into the mix and you have conditions more like UK winter; you’ll need to equip to match. 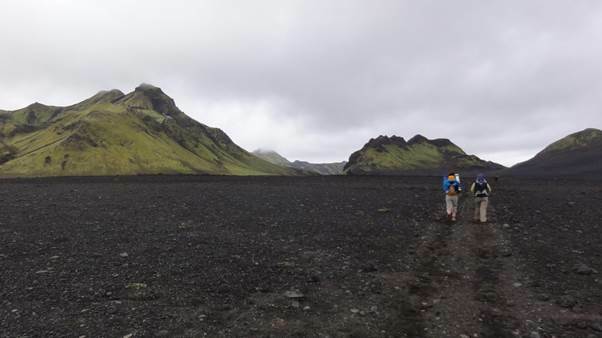 The Laugavegur in September is not a Summer trek! What the guide books don’t tell you is that the weather over the pass to Skogar can be seriously bad at this time of year. Get local advice and heed it before setting off on the extension to Skogar. Your first big decision is going to be where to stay on the trek: tent or huts (though if the weather gets really bad you may be forced into the latter anyway). There are five huts along the main route (one at either end, in Landmannalaugar and Thorsmörk, three more along the way). The huts at either end are almost hotel-like, whilst those en-route are clean and comfortable but quite basic. You can expect outside loos and showers, communal sleeping and cooking facilities and no hot water or electric power (though some have hot showers at extra cost). The huts are quite expensive - £30 per person at the time of writing - and are far from the ‘virtually empty’ described by Lonely Planet as a late season bonus. Either end of the trek has a decent campsite with reasonable shelter (but with ground full of volcanic cinder, so bring a groundsheet to preserve your tent). The first two campsites along the way are high, cold and exposed. The campsites en-route are free, whilst those at either end are about £10 per person (which make them quite pricey for a group sharing a big tent). Some people head straight off on trek from the Landmannalaugar bus to avoid the camping fee, but they miss a huge treat in doing so: the superb, free, hot, deep and wonderful Landmannalaugar hot pool; more on that anon. Wild camping is – I think- pretty much OK after the first day (when you are walking within the Fjallabak Reserve and wild camping is definitely forbidden). I met a couple who wild-camped the whole route, but they did spend one memorably terrifying night clutching the tent poles in a howling gale. Consider that many parts of this route are a long way from civilisation if you get into trouble. 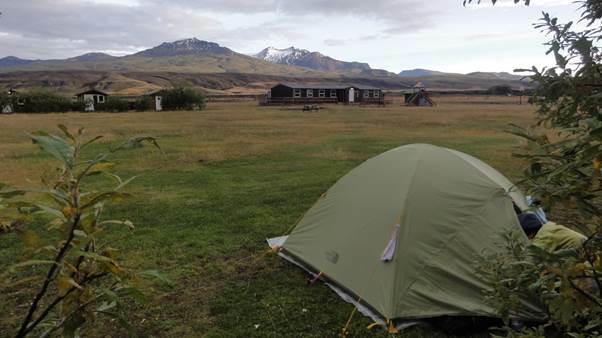 Finally, if you’re on a budget there is an excellent campsite in north Reykjavik, easily walkable to the city centre, for your transit days. As I said, gear up for winter, not summer conditions. Some brief suggestions follow. I never once felt close to needing a pair of shorts, but could have done with a few extra layers of fleece and some more dry clothes. It was warm enough to walk in a T-shirt on occasion however, so take a range of layers (but avoid cotton as once it gets damp it never dries). Decent waterproofs are essential, as are a hat and gloves. A light down jacket is great comfort-wear at camp, but you’ll need to keep it dry. Most people wear mountain boots, but we got away with our usual cross-hiking trainers. Instep crampons could be handy for the extension to Skogar (actually, on the day we did it, an ice axe and rope would have been handy as well, but not usually). There are some thigh-deep rivers with strong currents to wade across – mainly on Day 3. If you are not used to wading icy rivers, take a pair of wetsuit shoes or Teva-type sandals for the purpose. If you go barefoot there is a risk of stumbling on a sharp stone - and in a couple of the rivers that could be dangerous as well as wet – so only wade barefoot if you’re confident (unlike me)! You really need a strong mountain tent and lots of pegs and guy ropes. You could risk an ordinary tent, but be prepared to scarper into a hut if things get rough. If you’re camping you need 3-4 season sleeping bags and a way of keeping them dry; a summer bag may be fine for the huts. I pack our sleeping bags in a waterproof sack meant for watersports – it’s vital to keep down/feather dry. Whether you’re camping or not it’s worth taking cooking facilities with you. Standard gas cartridges for mountain stoves are available at both Reykjavik and Landmannalaugar (but not en route). Kindly people often leave part-used cartridges at the main town campsites in Iceland, but again NOT along the trek! I have not seen white gas on sale in Iceland (but it does turn up on the swap shelves at campsites). I have used an MSR Whisperlite gas stove for many years and can highly recommend it – hot, easy to start and usable in a high wind. A couple I met had great success with an army surplus ‘Hexy’ stove which uses solid fuel that you can get away with packing in your checked baggage. The huts do not provide catering, nor do they stock any kind of supplies, so you’ll have to carry enough food for the trip and perhaps a day spare. Specialist boil-in-the-bag camping food from the likes of Wayfarer is great, but heavy and expensive. You probably have your own ideas about trekking food, but consider the following dried/long-life options if not. · Instant couscous (we like Ainsley Harriot’s). · Salami-type cured sausage (fried and added to mash it’s a delicious high-calorie meal). · Instant porridge (tastes foul at home, but great on trek for some reason). Rarely needed on this well-marked route, BUT … when you need them you really need them, so don’t go without! The best map, showing the whole route at 1:100,000 scale (and Thorsmörk at 1:50,000) is the ‘Serkort 4: Landmannalaugar, Thorsmörk, Fjallabak’. You can buy this online from the likes of Stanfords. Magnetic declination (the difference between true and magnetic north) is significant at this latitude, about 15° W: set your compass or know how to adjust bearings for it, just in case. On this website, you knew it! But seriously, a small monocular is a very handy item on a trek like this. I needed it to find the movable river-bridge in Thorsmörk on Day 5 and sometimes to find distant trail markers. A cheap 10x25 Chinese one is light and sufficient, but obviously a Nikon 7x15 or Leica 8x20 would be better. Iceland’s main international airport is at Keflavik and it’s about an hour from the capital Reykjavik, situated in a remote spot at the end of the Reykjanes peninsula. The airport transport everyone uses is the ‘FlyBus’: it’s easy to book on line, leaves every hour or so and is a comfortable journey with free WiFi. 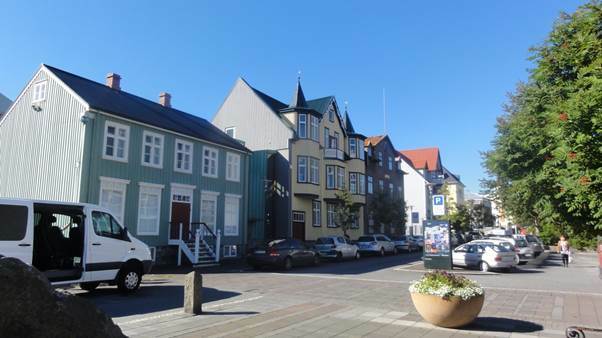 The bus will drop at individual hotels for an extra fee, otherwise at the main Reykjavik bus terminal (BSI) located just south of the cathedral. There’s a ‘but’ clause regarding this service, of course, and it’s the price (£20 return or so per person at the time of writing). There may be a cheaper alternative. At the Reykjavik campsite I saw an advert for a cheaper bus, so it’s worth doing a bit of research online before you book. The main bus to the start of the trek, if you do it in the ‘usual’ north-south direction, is a daily scheduled service that runs from mid-June to mid-Sept. It’s not one run by the main Icelandic bus line (Straeto). Instead it’s run by Reykjavik Excursions from the main (BSI) bus terminal in Reykjavik where the airport bus stops. Tickets can be booked online at www.re.is. The journey from BSI Reykjavik to Landmannalaugar is a long one (about 5 hours) and in the latter part very scenic: the bus is a special high-clearance vehicle enabling it to take a route that makes use of cross country tracks. The downside of this spectacular journey is again the price (about £45 per person one-way). 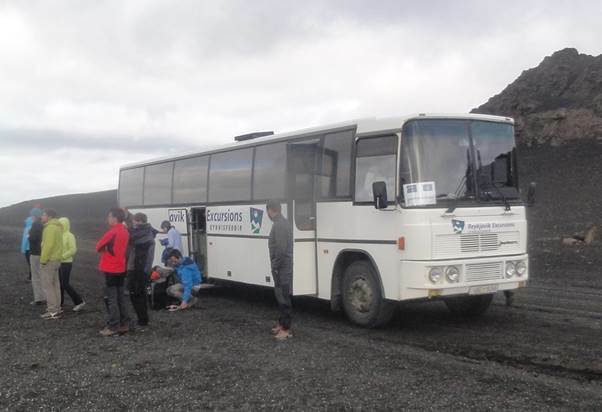 The bus from Thorsmörk (the end of the unextended trek) back to Reykjavik is another one run by Reykjavik Excursions. It similarly makes use of unmetalled tracks (and for a while a river bed) and so is based on a 4wd chassis. Again the service is daily (afternoons) and runs roughly from June 13th to Sept 15th. The main pick-up point is the Husadalur campsite in Thorsmörk (Husadalur is the closest hut/campsite to the end of the Laugarvegar trekking route). Once again this is an expensive service. If you extend the trek to Skogar, you can make use of the scheduled buses (run by Straeto) back to Reykjavik. This has several potential benefits. For one thing you are no longer tied to the mid-September end-date for your trek that the Thorsmörk bus enforces. For another, the service may be a bit cheaper (though not by as much as you would think). The Straeto bus stop at Skogar is a few hundred metres north of the campsite, opposite the public loos. Buses (routes 51 and 52) go a few times a day back to Reykjavik, but you will likely need to change at a little place called Fossnesti. The bus we caught went at 12:25 (but obviously this could change). Most public transport in Iceland goes via Reykjavik and so you’ll most likely spend a day or two in this most northerly and unusual of capital cities. The outskirts of the Icelandic capital have experienced the usual urban sprawl of shopping malls and flyovers, soulless technology parks along the northern waterfront. But the centre is somehow simultaneously folksy and Soviet. Many of the municipal buildings and apartments blocks look identical to their counterparts in Russian provincial cities for some reason, but the centre is a thriving muddle of old wooden buildings, quirky shops with arty window displays and trendy cafés. I’m told the nightlife in summer is frenetic, but in September that’s all winding down. Still, Reykjavik is one of those places it’s impossible not to like. The bus to Landmannalaugar departs early from the BSI terminal south of the cathedral. The bus is a special high-clearance model that’s less comfy than a modern coach and the journey is a long one. It starts with the main road out through the suburbs and past a Shell petrol station that is currently one of very few anywhere that makes and dispenses hydrogen as a car fuel. Reykjavik suddenly gives way to countryside and the bus continues through the farmlands of southern Iceland. Still, the farms are few and remote, the fields huge and mostly seem populated with stocky little Icelandic horses. Trees are few and look like a decorative luxury in such a barren landscape. 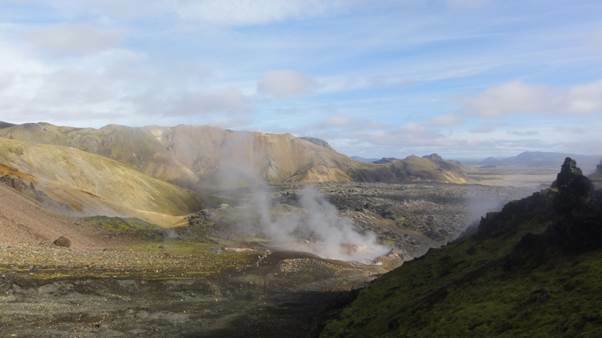 The farmlands give way to a wilderness of lava flows (already familiar from the airport transfer), as the bus climbs gradually up to the geothermal power station on Mt Hengil, before the curving descent towards Hveragerdi with views of numerous steaming vents in the valley below. Mt Hengil and the hot-spring riddled valleys below it offer interesting hiking opportunities for another trip. The next part of the journey is irritatingly longer than it need be, as the bus meanders back and forth picking up the odd local passenger and making various lengthy stops– including Selfoss and Fossnesti. But at least there is a mildly entertaining taped commentary to listen to as it does so. After a couple of hours, the bus turns left onto a dirt road (Rt 26) and the journey becomes much more interesting. The road is simply a rough track, impassable for much of the year, which winds off among dunes of ash and expanses of new lava. It was apparently never planned as a road, but just arose over generations travelling between remote farms and homesteads on foot, horseback, by cart and finally 4WD. 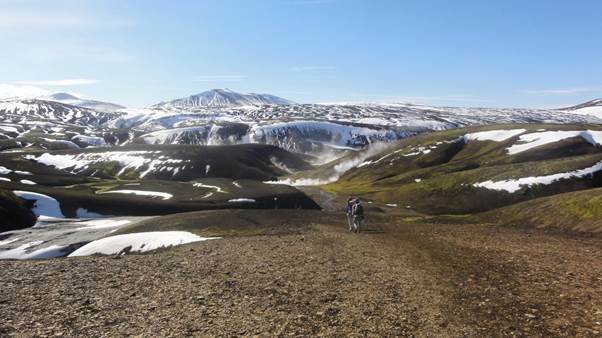 Much of the scenery was created by a blunt snow-capped mountain to the right which is Hekla – a very active and potentially dangerous volcano. At one point the bus makes a stop – in a wind-blasted nowhere of newly-minted lava – and a few brave souls get off for the trek to Hekla. The journey on to Landmannalaugar takes hours more, but mostly the only living things you see are a few hardy cyclists and lots of fluffy Icelandic sheep. The scenery is spectacular for the whole drive – barren mountains, wild lakes and lava-choked valleys. There is almost no sign of habitation until the small group of huts at Landmannahellir. After that, another brief drive and a lurching river ford and you arrive at last … but where exactly? If you were expecting some kind of settlement, a picturesque village perhaps, at Landmannalaugar you’ll be disappointed. It’s a flat valley backed by a rough lava flow and surrounded by desolate rusty-coloured hills, with a few huts, a campsite on which grass apparently refuses take root (the climate is too harsh) and a pair of old buses called the ‘Mountain Mall’ which sell essential supplies. The famed beauty is of a distinctly Icelandic variety: wild, barren, remote and desolate. There is a compelling compensation for any lack of Alpine prettiness, though: the hot pool. Apart from some strategically placed rocks to form a little dam, and a wooden changing platform, the pool is completely natural. It occurs at the confluence of a warm river and a boiling hot stream that runs in from the side, both emanating from nearby hot springs. The river is sandy bottomed, pleasingly clean, slow moving and deep, the pool big enough for loads of people. Unlike many natural hot springs the water has little taint of sulphur and the temperature varies from warm-bath near the platform to scalding-hot as you float blissfully towards the deepest part near the dam. At one time there was a problem with parasites brought by ducks (which seem to appreciate the hot water as much as humans), but these cleared a few years back. We spent most of the day in the pool – soaked and soaked til we turned wrinkly – with no ill effects apart from a trekking-unfriendly desire to loaf … and loaf some more. In fact just about the only downside to the Landmannalaugar hot pool is the chilly late-season wind which makes getting out a painful experience. As night sets in and the air chills, the steam above the pool becomes thicker until it wreathes the whole area like a mist; time to make a dash for towel and clothes. Walking back along the boardwalk to the campsite that evening, the vapours from the steaming marsh around the pool rose towards a clear sky beginning to be filled with stars. This is one of the darkest skies you’ll see, remote as Landmannalaugar is, and so one of the best places to look for the aurora and a sure thing for the Zodiacal Light if you’ve never seen it. Later that night, climbing out of the tent in the small hours, I did catch a faint pulsating glow to the north which briefly formed a faint, shimmering curtain – a tantalising hint of what you might see here if you get lucky. The temptation to spend the day lounging in the Landmannalaugar hot pool is overwhelming and if you have time, why not?! But if you need to get going it’s time to buy a few last minute provisions at the ‘Mountain Mall’, hitch up your pack (it will never feel heavier) and sign the warden’s log-book. It’s a fairly dry day as well, so take plenty of water (don’t drink geothermally-polluted stream waters en-route, which might contain nasty stuff like heavy metals and are sure to taste foully sulphurous). 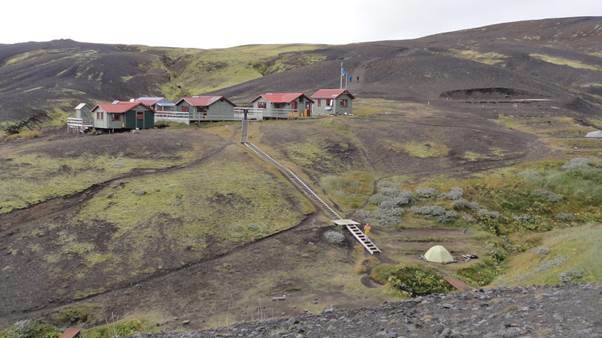 The path out of the campsite runs from behind the huts straight up into the ‘Laugahraun’ lava field. The latter is impossibly rough: piles of clinker, twisted rock formations and a maze of deep gulleys and miniature canyons, all covered with velvety moss. The walking route is easy enough to follow and gives superb views back to a river and distant lake (Frostastdavatn) surrounded by barren mountains and on to steaming vents and more mountains ahead. After about an hour you finally climb down off the lava flow. The path veers left for a short way, then right and up by a cluster of vents puffing roiling clouds of white steam. Given the barren, rusty-orange mountains, black hoodoos (old volcanic events eroded away) and general lack of vegetation or life, this is one of those ‘off-world’ spots you’ve come for. Stop and listen: only the wind and the hissing, bubbling, boiling vents break the primordial silence here. Turn left at a sign beyond the hot springs and then up and onto a ridge tinted with volcanic colours – vermillion, purple and yellow. From there the path follows a steep gulley up and over a minor pass next to another blackened lava flow that has pooled in a hollow. From here you can take a short detour up a path to the right leading to a viewpoint next to a weird black tower of basalt. The next few miles of the Laugarvegur are some of the most interesting. In the middle distance are shining, snow-covered volcanic mountains. Nearby are numerous geothermal features around the path. At one point you pass by a hollow to the right of the ridge you’re walking on that lazily puffs billows of steam to fog your way. A little further is a fumarole next to a stream - spitting boiling water and roaring like a jet engine. On the left is a strange, shear-sided round hole like a smoking well, called ‘Storihver’. Close by, the path runs between two more geothermal zones: to the right a region of violently boiling and hissing ground, to the left an odd pond of hot milky-turquoise water. There are many more steaming pools and springs in the distance. Around the hot springs and streams, the ground is coloured by strange algal growths, the hot-water full of wafting streamers of bacteria: these are the extremeophiles you may have read about, similar to the first organisms. Did life on Earth (or even on Mars) emerge in conditions like these? The path climbs thereafter, becoming colder and snowier, onto another lava flow. But this time the flow (named ‘Hrafntinnuhraun’) is flatter and bleaker, all covered in sharp lumps of black glass – volcanic obsidian. This section is a bit of a slog, but eventually descends to reveal the first hut of the trip after perhaps just 3-4 hours of walking. Hrafntinnusker Hut is unfortunately perhaps the least appealing of those on the trek. It’s in a weather-battered location high up above a wide barren valley, has no running water, plain benches to sleep on and the bleakest of campsites. The latter is just stones and promises howling winds; only the toughest campers would pitch here (though some have thoughtfully erected low stone walls for shelter around some of the pitches). To the rear of the hut is a steep descent to some hot springs by a river and a small hot pool for bathing. Note: You may be tempted to move on from Hrafntinnusker, but if you are be warned that the hike to the next hut will turn this easy day into a fairly tough one! Leaving the Hrafntinnusker Hut (and you’re probably not sorry – even the warden seems atypically miserable and surly), the path winds down towards the river and then proceeds up a steep bank of soft volcanic cinders (as treacherous as marbles underfoot), across the top and then down to another stream, only to repeat the process … again and again. Earlier in the season many of these gullies would have been bridged by snow, but where they still are, the bridge has sunk and looks worryingly thin, making for much slithering and splashing to detour. The endless slogging up and slipping down is very tiring, especially wearing a pack. But at least the path is well marked by tall white posts at regular intervals and if you still have the energy, the view of snow-capped volcanoes all around is still way beyond most peoples’ spectacular. Occasionally the gullies you are traversing open out into flatter, lower, greener land to the right, inviting wild camping (though strictly you may just still be in the Fjallabak nature reserve, where it’s forbidden). The scrabbling up-and-down ends abruptly at one last long and gulp-inducingly fragile snow-bridge over a larger river into which falling wouldn’t be healthy. Beyond, the path climbs steeply up and stays there. What follows is one of the wildest parts of the whole route – an extended pass to the west of a small icecap called ‘Kaldaklofsjökull’. The name sounds chilly and fierce winds from the icefields and glaciers nestling under blackening clouds to the left made me wish I’d packed another fleece and some thick mittens. Left of the ridge are interesting geothermal features and extraordinary views towards the icecap, but high winds made exploration impossible and we had to push on before we were blown away. Every time you think the path must surely descend to more sheltered terrain … it doesn’t. After a mile or two you can see the low, green valley and lake ahead where you know the next hut is, but the path keeps miraculously finding more high ground, with one last geothermal area of steam-hissing springs and coloured algae for interest. There is nowhere you’d want to camp here – it’s all too rocky and exposed – so you have to press on. At one point, the way descends to a river in a steep ravine and you feel sure the path will follow the river out into the lowlands, but again it slogs back up onto another high ridge. Eventually the path does start the long, steep descent towards Alftavatn – a large lake set between green hills – but remains tiringly steep, twisting and rock-strewn. If you decided to push on from Hrafntinnusker, this is the point where you might wish you’d slept on those hard benches after all. Even once you make it down to the extensive valley north of Alftavatn, there’s a way to go to the hut. The landscape here is softer and less barren: bank after tundra-covered bank of volcanic ash and scoria incised by winding streams. Each stream valley has numerous grassy flat spots that look perfect for camping, but unfortunately they all seem waterlogged on closer inspection. The first river you come to in the valley may need to be forded, if the wobbly single-plank we crossed has been washed away. The Alftavatn hut looks much like the one at Hrafntinnusker – white clapboard under a red tin roof - and in truth its location isn’t much less bleak. It lies close to the shore of Alftavatn whose cold waters are obsidian black and the landscape around is vast, mountainous and treeless. There are flat camping sites above the river behind the hut, but when we arrived in early evening there was only a solitary tent and that was being taken down. The reason? The wind was already gusting towards gale force. We tried to pitch in the lee of the toilet block, but gave up. I knocked on the warden’s hut door. “Is the wind here usually this high?” I asked. “This wind is not high, it is normal. Now it is 15 m/s, tonight it will be 20 …” came the laconic reply. So, like us, you may find yourself opting for the hut. If you do it’s about £30 per person and yes they take credit cards. The hut is pretty comfy. All outdoor gear has to be taken off in the entrance hall, so it’s clean and dry with lots of bare Scandinavian wood lit by a myriad tea lights. There are gas cookers, sinks, tables and a gas fire (so it’s toasty warm after that bitter wind). Four or five dormitories (mostly under the eaves on the upper floor, accessed by a wooden spiral) sleep from two to twenty on benches with decent mattresses, but arrive early if you want a couplesey twin to yourself. The atmosphere in the hut is convivial with a mix of nationalities cooking, eating, chatting and reading (some people do this trip carrying a thick novel!) around the long tables. The heated showers cost extra and (like the loos) are outside set off about 50m away in their own hut accessed by a wooden walkway; there is no hot water (or electricity) in the main hut. But after the prospect of camping it seems like an absolute haven compared with that remote, wind-blasted wilderness outside the door. 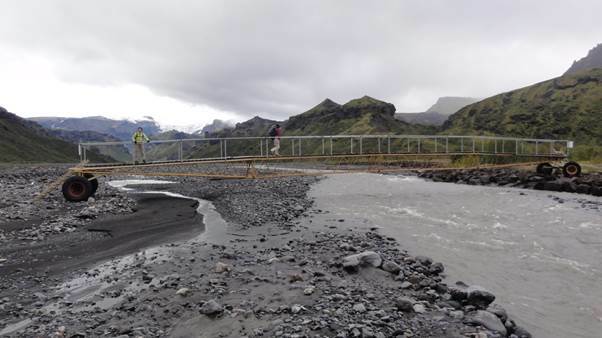 After what may have been a rather sleepless night worrying if the roof is going to blow off over your head, the immediate prospect on regaining the Laugavegur footpath is a river crossing. The crossing is only about 200m to the right of the hut door and I had been prepared for it by rumour in the hut. In fact you can put off your first foot-in-icy-river experience, because there is a bridge hidden a way off the main path, down behind the toilet block. This is the river-crossing day, though. So up and over a steep hillside and half an hour’s walk later you come to another river crossing and this one can’t be avoided. People make a big fuss about it, but this first one is the easiest – only shin-deep. Yes it’s cold, yes the stones are sharp. It’s easier for me because I know of old that my tender tootsies can’t take it, so I just yomp straight across in my boots and suffer cold feet for the rest of the trip – no worse in truth than a damp day on Dartmoor. The next short section is easy. 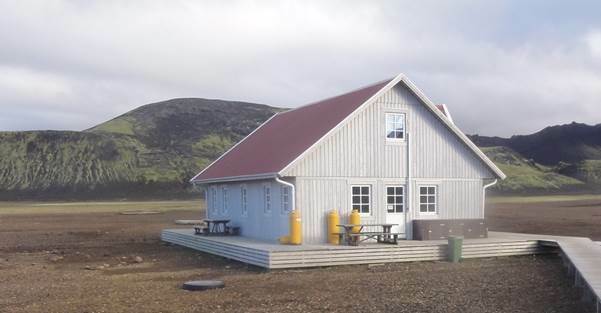 Undulating hills and big views of conical volcanoes lead to the next nearby hut at Hvanngil. Only the laziest hiker would stop for the night again, but if you arrive at Alftavatn early enough and it looks too bleak, Hvanngil is a much more inviting location for your second night (we arrived too late to continue). The Hvanngil valley is sheltered and grassy; the hut nestles amid hillocks and has comfortable-looking campsites in their lee. Beyond the hut the path traverses a short lava field and then comes to another river, a big rushing torrent. Fortunately there is a bridge, held down by huge storm-defying boulders. Take a photo (it’s a scenic spot), have a snack by the river; smile and be happy … because - like life - something nasty could be just around the corner. The next river crossing is a much more serious business. There is a level track on either side, possibly even a vehicle ford, but your soft-roader won’t get through here. The water is thigh-deep even at the shallowest spot, numbingly icy and fast flowing. Take care because if you lose your footing and go under wearing a heavy pack it could be dangerous. Just minutes in that water and my feet are like dumb blocks on the end of peg legs – that’s how cold it is. 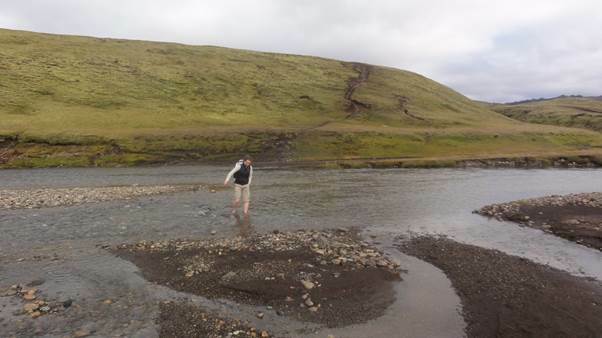 That, you’ll be pleased to hear, was the last major ford for today (the next biggy is right at the end of the Laugavegur tomorrow, near Thorsmörk): there is another river later today, but it’s safely bridged, and another shallow one that might need socks-off in very wet weather. Beyond that last ford the way is easy – along a flat vehicle track for a few km before veering off left towards another range of lunar mountains. It’s an opportunity for some much needed chatting and good cheer, dampened just a little by a lonely white cross on the hillside yonder – presumably some foolish soul who tried to make that ford in a BMW X-series. The path crosses that next river on another nice safe bridge, then wends its way towards the spiky hills you’ve been admiring to the east. The walking here is over a flat plain of jet-black ash and clinker - a ‘one small step’ landscape. 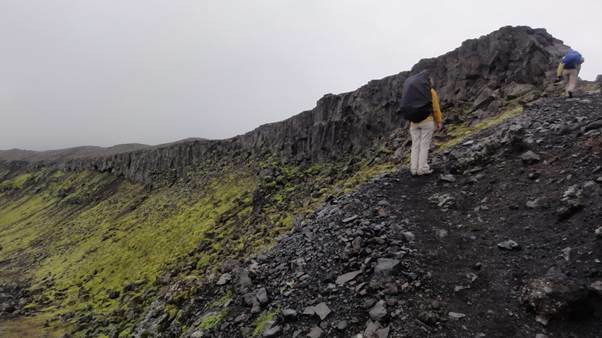 The Laugavegur starts to climb again after much almost-flat walking and eventually winds up and over a low pass set between banks of freshly-erupted ash and lava with steep hillsides around. Past a twisted, rusty hoodoo on the right the next valley feels even more remote than the last. A view between hills to a barren plain and more mountains beyond reminds me of ‘Saturn seen from Titan’ by Chesley Bonestell, a print of which hangs in my study. Ignoring the moss, you could almost expect to bump into a Mars rover drilling a rock round the corner. More gentle undulations, a region of tussock grasses that offer scant shelter for cooking lunch, past a big green mountain called (imaginatively) Graenafell, then the views open to a canyon and more mountains on its far side. Up and over another pass by a conical mountain on the left called ‘Hattfell’ and in good weather there are views of distant ice caps. It’s tempting to carry straight on towards them. Don’t! The path ahead leads to a dead-end canyon overlook. 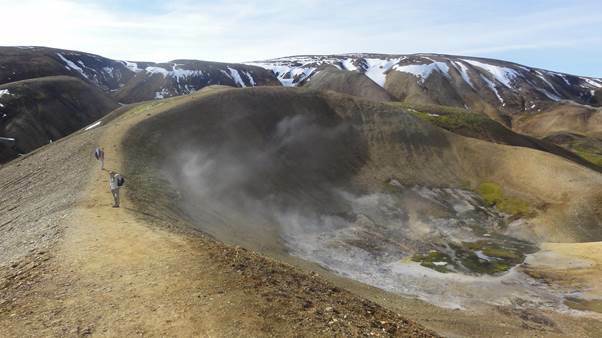 Meanwhile the Laugavegur takes a sharp left downhill behind Hattfell towards the next hut at Emstrur. The Emstrur ‘hut’ is a collection of smaller bunkhouses and is more Spartan than the previous two. For campers, though, Emstrur offers the best spot of the entire route. The campsite consists of individual pitches alongside a small river in a narrow valley beyond and below the huts. The pitches are dry, level and sheltered, but most of all much less barren than the previous ones: the river babbles, birds flitter and twitter amongst a mass of tall herbs and flowers along the banks. It’s a very pleasant place to spend the remainder of the day and - like the other campsites en-route – it’s free! Note: this is the last real dark-sky campsite on the route (Thorsmörk and Skogar have street lamps and some sky-glow), so get out of your sleeping bag and look for Northern Lights! Across the river from the campsite, the footpath climbs a steep ashy bank away from the lush (by Icelandic standards) haven of the river valley. At the top is a view across a desert of black ash towards more barren mountains and a vast glacier beyond them. In front is a salutary sign. The two main icecaps (Jökulls in Icelandic) that you glimpse brooding on the horizon for much of the trip are Myrdalsjökull and Eyjafjallajökull. Now if the latter name seems like it rings a bell, that’s probably because the volcano that underlies it became famous a few years ago when it spewed ash into the skies over northern Europe and caused travel bedlam by shutting the airways. What you may not know is that the other, much larger ice cap – Myrdalsjökull – also hides a volcano, a much larger volcano called Katla. Now I have a friend (a Geologist) who worries a lot about Katla. His fears are not neurotic. For Katla historically often erupts a few years after Eyjafjallajökull and is overdue based on its historical cycle. 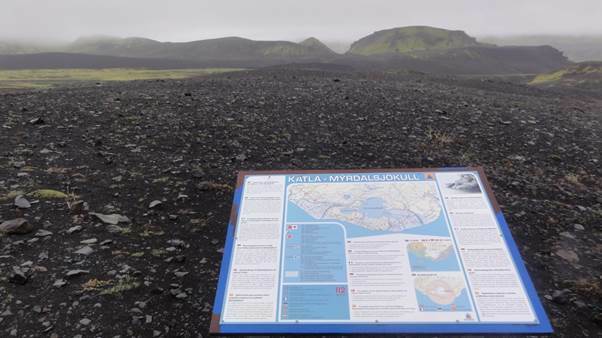 When Katla erupts it is likely to have grim effects on northern Europe in general and of course Iceland in particular. The Emstrur sign soberly reflects that fact. It surely can’t escape the notice of even the most geomorphologically blind that this part of Iceland has strange valleys – huge flat river beds of barren cobbles worthy of an Amazon, but cut by rivers no bigger than a Lakeland beck. The reason is the phenomenon of the ‘Jökullhlaup’ – a flood of biblical scale, caused when the better part of an icecap melts at once, that indeed sends flows greater than the mightiest rivers down these valleys. That sign shows where these floods are likely and the best escape routes. Apparently hikers will be warned of a Katla eruption by copious flares and maroons; I’ve never looked forward to a firework display less. 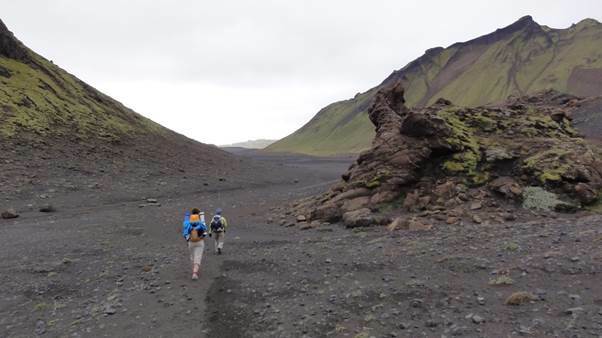 After the Katla Geohazards sign, the Laugavegur has a few ups and down through other small valleys before descending towards one of the most dramatic features of the entire trek – a deep canyon in the ‘Ljosa’ river. The descent is a bit of a scrabble in parts and feels quite exposed at the rim of the canyon where a slip into the moiling torrent a hundred feet below is unthinkable. But the bridge across is a viewpoint so singular that you’ll want to pause for Facebook photos. After the Ljosa canyon, the path climbs back onto a level route with enormous views of mountainous wilderness, plains of ash and rusted volcanic rock. This is the last completely wilderness area of the Laugavegur route and another of those off-world places created by Geology and Meteorology alone. The walk through this region culminates in a small pass where the path goes up and over the end of a lava-flow cliff that extends for miles. Just off the path to the right is an overlook with a giddying drop into the canyon. In front you can see spectacular columns in the basalt lava flow that remind of the Giant’s Causeway. After that final stretch of dramatic wilderness, the Laugavegur gradually descends to the more gentle landscapes of the Thormörk valley. It starts with patches of bushes and shrubbery invading and colonising the barren volcanic landscape of lava flows and ravines. Then you glimpse the red-roof of a solitary hut across the river in the far distance. Finally you come to a picturesque copse of birch (björk) sapplings clustered around a small bridge. You won’t have seen a tree for a week and they look very welcoming here, the perfect spot for a wild camp perhaps, if you want to avoid the Thorsmörk fees an hour further on. The real highlight of this region might go unnoticed under your boots, though. 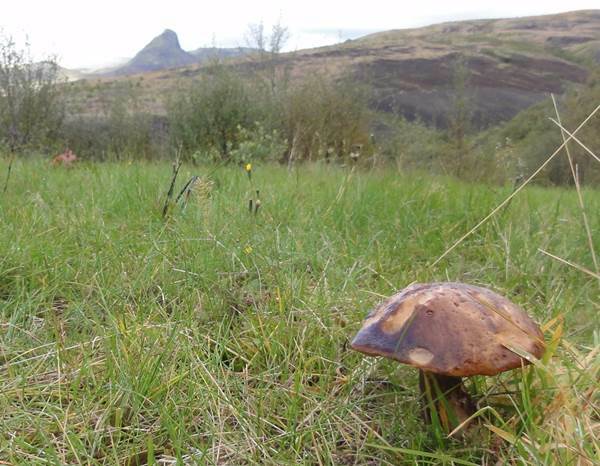 What you are walking over now isn’t the usual bare ash or patches of moss – it’s tundra! And that means berries at this time of year. If you look carefully you’ll see two main types of berries hiding in the varied low-growing shrubs around. 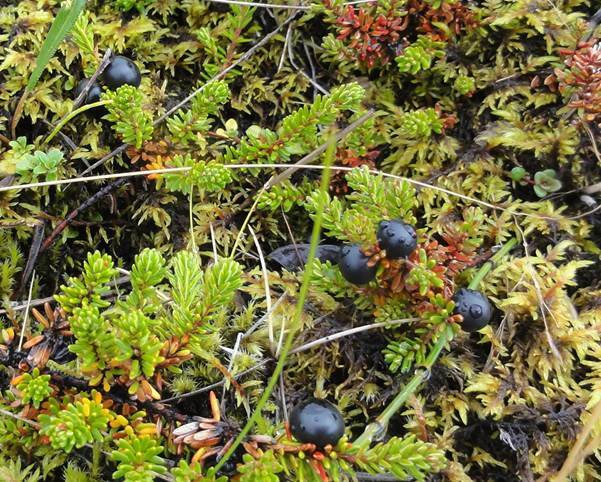 One type is the small glossy black Crowberry, an expensive delicacy back in Reykjavik that has subtle astringent flavour. The other main type is a delicious tiny blueberry that (if you’ve been living off dried noodles) might be just what you fancy at this point in the trek. In Kamchatka or Alaska you’d be worrying about bear-shaped competition for tundra berries; not here. Relax on the tundra over the bridge, fill up on berries amid the carpet of plants and flowers, because just over the hill is the last (and perhaps worst) river crossing. The valley is wide and rocky and you can stone-hop the minor river braids, but the main channel is deep, fast-flowing and unavoidable. Again, make sure you don’t stumble into the torrent here, even if that means wet boots rather than cold bare feet. Across the river, the path continues up into proper birch forest on the hillside. The path entrance is difficult to spot and lies some way to the right of where the path ended on the opposite bank. You’re in Thorsmörk now and the paths are broad and signposted. At this time of year there are numerous large mushrooms under the trees – various varieties of fleshy-looking boletus that are tasty when young (but maggotty otherwise). If you arrive here late after Thosmörk has shut for the season, at least you won’t starve! 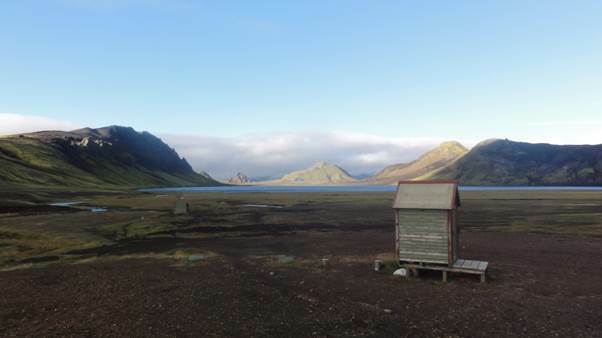 There are three huts in the Thormörk area – Husadallur, Langidallur and Basur. Husadallur is the nearest, largest and the one where the bus stops by default. It’s more of a small recreation village than a hut, with a large campsite, restaurant, shop (with beer, but don’t get too excited, it’s £6 a can) and in theory a hot pool and sauna. Don’t base your decision to stay on the latter, though: the ‘hot pool’ is a lukewarm, concrete-lined, ankle deep puddle; the sauna was closed. At least the showers are free and there is a heated dayroom for cooking and eating (also free to all). 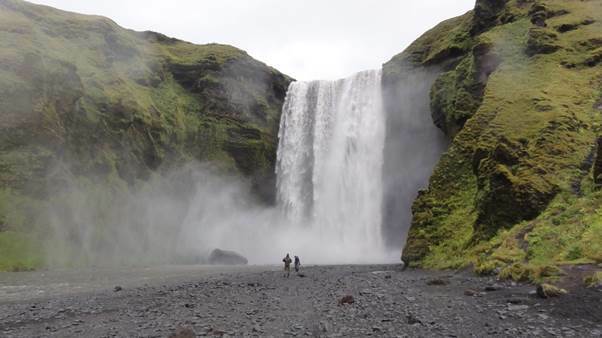 If you’re finishing here, a minor celebration in the bar and a proverbial notch on your walking pole is in order – you’ve completed the Laugavegur! If you plan to continue over the pass to Skogar, a health warning is required. The Lonely Planet says: ‘this walk is fairly easy and you won’t need any special gear’. · 1000m of overall elevation gain, with lots of extra ups and downs. · Some sections with significant exposure (i.e. big drop-offs) and loose footing. · Short sections with fixed ropes and some scrambling. · Long sections of very rough terrain over new lava. · Some traverses of ice and snow on steep slopes and snow bridges over rivers that may be perilously weak and crevassed late in the season. That lot would make this day significantly harder than the rest. But the problem is the weather: there’s nothing between the pass and the N. Atlantic. Wind speeds of 20 m/s are quite ‘normal’ and on the afternoon/night we spent in the hut at the top the wind was gusting to over 50 m/s, plus freezing temperatures and heavy snow. To spell it out – that’s not ‘survivable’ weather; if we hadn’t made the hut before the worst of it hit in the afternoon, we’d have died. It’s a salutary tale, stay with me as I tell it. To start the day, the weather down at Thorsmörk was peaceful, if overcast. Initially, the route leads back out the way you came, then follows the blue markers steeply up wooden steps past a ‘singing cave’ – an aperture in the rock that whistles and moans in the wind. Over the top, the path drops down to the nearby hut at Langidalur (and past the official end of the Laugavegur). Here, the path itself appears to end at a huge floodplain (yes, one of those) of grey sand and cobbles. On the far side (you can’t see it) is a river much too fast and deep to ford. There is a movable bridge-on-wheels across it, but it’s a kilometre or two up valley and you need that monocular to find it. The way across the valley to the bridge is an unmarked stony trudge and I can’t help noticing the turquoise ice falls of a vast glacier plunging off Myrdalsjökull at its head in the distance. The idea of that lot melting in a big rush is discomfiting to say the least; but it will happen one day soon, most likely accompanied by a last unheard expletive from some hapless hiker crossing the valley below. Across the bridge, you turn left away from the last of the three Thorsmörk huts at Basur. The path crosses another bridge over a side creek, before a map and sign, then climbs long and hard up a spur towards the clouded mountains above. At some point you have to traverse a short knife edge with big drops on both sides. We met a lady prostrate and clinging to the far side with a look of terror, but it’s not that bad – like a short section of Striding Edge back home in Cumbria. The path continues past some big lava caves on the left (back to those later - literally) and a short fixed rope for a steep slippery scramble. 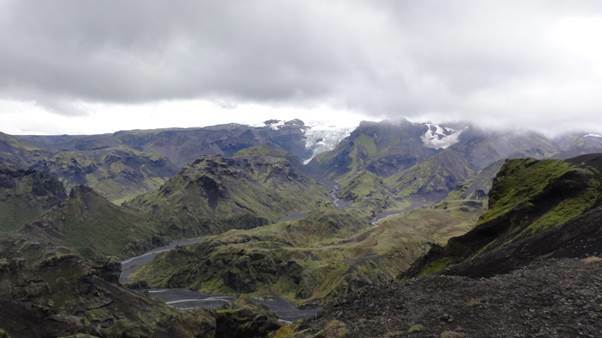 Another half hour of uphill and you get the first big views of Myrdalsjökull on the left: more tumbling ice fields. Up til then the weather had remained reasonable for us – in line with the forecast. But as we climbed higher heavy rain drops began splatting into us and big, eddying gusts whirled down from above, pushing us off balance. Round a shoulder of mountain, the path took a steep rocky scramble up to a pass and it’s there that things got much worse very quickly – screaming winds driving heavy rain. Lesson 1: put on more clothes before the weather turns so bad you can’t. I would have turned back, but was persuaded on by a Spanish couple who had booked in at the hut and were sure it must be near. As it turned out it wasn’t. Lesson 2: trust your own judgement. We struggled on through howling winds across a desolate plain of rocks, past a signpost, to a big rocky step down before another col with steep slopes hundreds of metres down to river canyons on either said. There we hunkered out of the wind - in the company of a seriously fit and strong couple dressed in army gear with Bergans - and considered our options. The Army Guy reported soberly that the col ahead was impossible given the wind and that beyond it was a long roped section above a precipice. It was all too clear that if 90kg of trained muscle couldn’t make it neither could the rest of us. We put on all our clothes, waiting for the forecast afternoon improvement in the weather. The improvement never came. Instead the wind howled over us with mounting ferocity. Meanwhile we were wet, cold and starting to shiver; the gale was backing inexorably round to face us. Sensing the situation was moving, slowly in incremental steps as such things do, from foolish towards fatal, I made a decision: back to the caves. The other couples decided to do the same. It turned out to be a good decision. The weather, completely contrary to the forecast, got worse and worse, but we made it back down, despite being bowled over by one savage gust. Trapped on the far side of that knife-edge ridge, easy in good weather, suicidal in 40 m/s gusts, the cave was our only option. That cave saved us. With a massive overhang, it was flat and completely dry inside, going way back into the body of the ridge. We pitched our tents inside, huddled around a stove to keep warm, cooked lunch, then dinner. 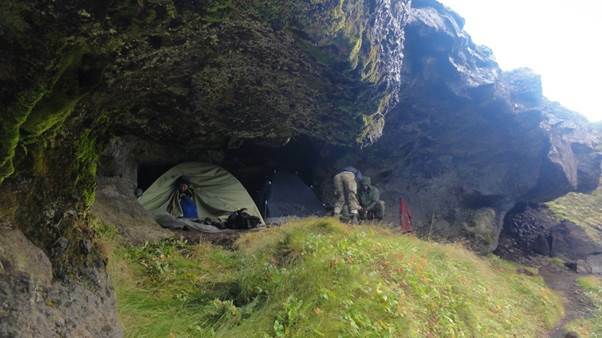 The weather got even worse – violent gales, horizontal rain; we spent a night as cavemen. I have had some unfortunate luck with late-summer weather. 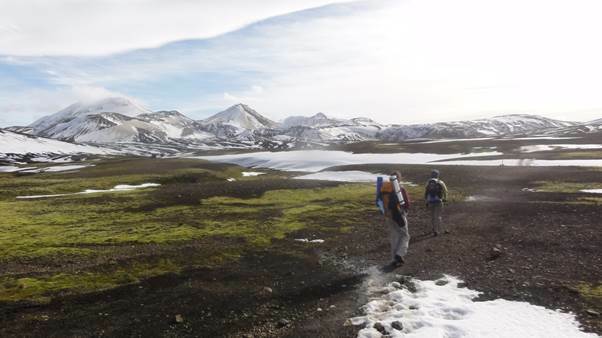 Twelve years back I spent a week theoretically ‘trekking’ in southern Kamchatka. They say everyone knows where they were when the Twin Towers fell; I was huddled in my sleeping bag, my guide blind drunk in his, whilst gales and blizzards raged relentlessly for days. So perhaps I shouldn’t have been surprised to have another Bad September moment, despite the weather forecast of a near-perfect late-summer day in Iceland. We set off from our sheltering cave early, but the wind and rain were already gaining strength again. Fortunately we got safely past the exposed col and the section of fixed-ropes and scrambling before things got really bad. But as we climbed still further, the wind reached gale force again and the rain turned to driving sleet and then snow in thick cloud that hid the trail markers. Underfoot, the going was ice and scoria and snow – slippery and treacherous. The climbing just went on and on; snow and hail battered us (a week later I still had the bruises to prove it). I think we all began to realise what would have happened if we’d tried to press on the day before. The higher we got, the worse the conditions became. We were all soaked and freezing, despite layers of GoreTex and fleece. Then we reached the new lava flows from Eyjafallajökull - up and over drifts of the roughest black lava and cinders where the wind drove icy shards screaming into our faces, slipping down past frozen lakes and across intervening stretches of snow with gaping holes to hidden rivers beneath. The army guy indefatigably led the way and we all owe him, though he admitted later that, like me, he had started to imagine the worst of outcomes. The route went on for hours. Then as things were looking really grim, the snow heavier, the wind more savage, clothes and boots icy and sodden, we came to a sign to the hut. Another kilometre of snow drifts and a terrible crevassed snow bridge across a raging torrent, and the Army Guy disappeared around the edge of a black outcrop lost in the driving snow ahead. Then with joy we realised – not an outcrop … a hut. 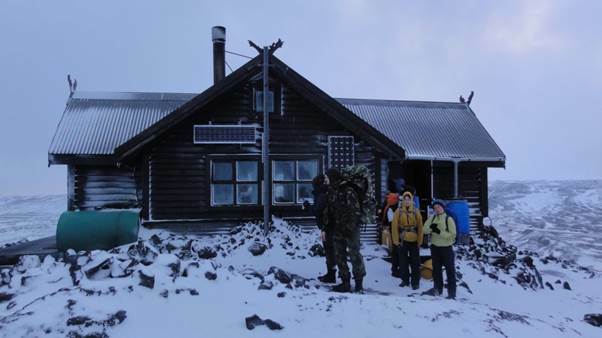 The Fimmvorduhals hut seemed simultaneously the remotest and the most wonderful place on earth that afternoon. We stepped around the iron range-cooker into near-sauna warmth. The hut was full of other stranded hikers lounging on the sleeping benches. As we dripped and steamed dry, the weather stepped up a notch outside. Up a ladder we found a snug, hiker-free loft full of mattresses where we spent the afternoon lounging snugly and chatting, despite the terrifying horizontal blizzard rattling the little window from outside. The ‘Army Guy’ turned out to be TA survival specialist called Carl moonlighting from his day job taking an Astro-Physics PhD at Cambridge (talk about alpha-male, as well as an all-round nice bloke). We discussed his research into protostellar disks and his trips to the Keck in Hawaii, argued with our wives about the philosophy of science and discussed relativistic time dilation; all whilst listening to Brahms on Carl’s mobile. Bliss, though not, apparently, for the teenage French hikers in the hut below – there were whispers of dissent, perhaps of mutiny. But I’m guessing Carl – also a martial arts expert, boxer and bi-athlete - didn’t look like the kind of bloke you’d argue with over his choice of music. That evening, our Spanish companions found an online weather warning for 50 m/s gusts at sea level (100 mph). By nightfall the winds had risen even higher for us stranded up there. We looked at each other and didn’t have to say it: two hours later setting off and we’d have been done for. Carl reported a scary experience just going out for a pee and we all stuck with the grotty indoor loo after that. During the night, the whole strong-built hut shook violently at every screaming gust. At one point in the deep of night, crawling from our snuggled mattresses in the attic, Carl and I began to collect our things, convinced the roof was coming off. Fimmvorduhals Hut in later summer! We set off again at first light, into a calmer world of thick white fresh snow. But before long the wind had picked up and the hail had started thrashing into us again. Out there in the night, even the signposts had blown down. Fortunately now we were warm dry and fed, at least for a while. After another few kilometres of tough walking, with icy stretches and snow bridges, slippery ascents up slopes of ash, we arrived at the second hut (this one an emergency shelter without heating). But from here an easy track led downwards towards Skogar with distant views of the ocean. Despite continuing hail we knew we were going to make it. The final descent to the campsite, café and bus stop at Skogar is anticlimactic, despite boasting the final biggest waterfall – the mighty Skogarfoss shown on every tourist brochure; anticlimatic because there are viewpoints and staircases and benches which seem incongruous after days of wilderness. The final trekking moments are of walking up the river into the mist of Skogarfoss, as close as you dare, for a last photograph of a tiny blurry human, standing in some attempt at a triumphant pose, beneath a mighty force of nature. 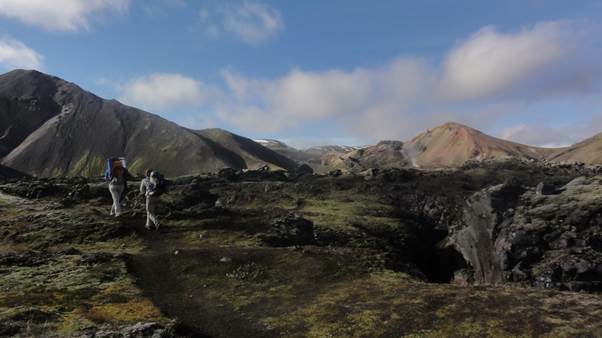 I can highly recommend the basic four-day Laugarvegur trek – it’s that rare combination of genuinely remote, lunar-landscape scenic, easily and cheaply accessible from the UK and quite straightforward (especially if you stay in the huts). I only glimpsed some auroral activity, but you might be luckier! Our companions in extremis later saw a good auroral show from the campsite in Reykjavik of all places. If you extend, be prepared for tough conditions on that final stretch over the Fimmvorduhals Pass late in the season and check that the hut is open before you set out – you might need it!